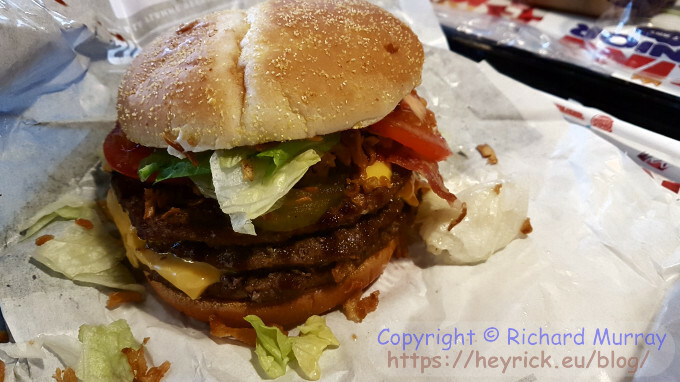 Having grown disenchanted with KFC (everything downsized except the price), and fed up with McDonalds (fewer specials, so it's always the same sort of things), we decided to try Burger King. The home of the flame grilled Whopper, etc etc. Unfortunately our closest that isn't in the middle of city traffic appars to be in Ancenis, which isn't exactly close. But, okay, it's a change. The first thing to notice is that you can still order from an actual person if you like. Or you can use a prod-screen terminal. I chose the terminal as it would lay out all of the options. The terminal can speak French and English ("nobody's perfect", it says). The organisation of the ordering is a bit messy. Like McDonalds, there are categories on the left, work area for most of the screen, and usefully a running receipt on the right. However there are many burgers and many meal options, so it can be a bit hard to work out what you want. Scrolling up an down the list can 'add' things to your order as it registers a tap rather than a scroll. I choose a Double Steakhouse which was €0,10 more expensive than the Double Whopper. To be honest they looked alike, the main difference here being that the steakhouse was on a bread bun with corn bits rather than the generic sesame seed bun. What might be an idea here is for Burger King to have some sort of icon to tap on so that if you don't happen to know the products inside out, it'll tell you the attributes of each. I mean, let's just say there's a "Chicken Surfer Dude" released in the summer. The picture is chicken, bun, lettuce, etc etc and a green sauce. Two immediate questions: is that chicken as in a processed nugget or as in a breaded filet, and is that green sauce avocado or pesto or...? It's a hypothetical burger, but the point remains, some descriptions might be useful. Now here's the mind-blowing part. The customisations. I recall back in England in the '80s BK did the whole "your burger your way" thing, and they're still doing this today. About the only thing you cannot do is change the bun your burger comes in. 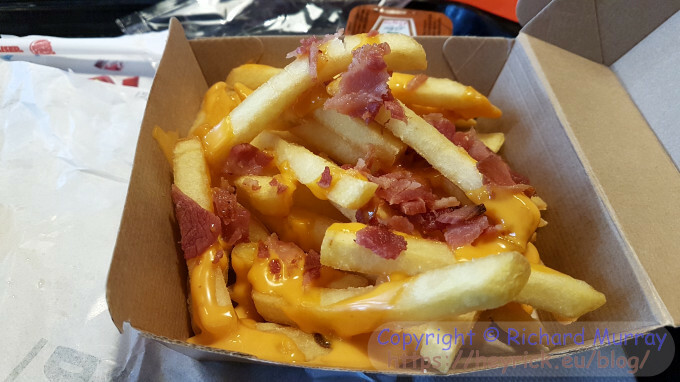 And while McDonalds also offers customisation options, they are mainly about leaving stuff off the burger (in case you don't like tomatoes, say). Not so with Burger King. They let you choose what sauces to use, plus the options are for less and more. So I could knock off tomatoes and add extra lettuce. Not only that, but for a small additional fee, extra burger (€1) and extra cheese (€0,40) are also possible. The default sauces were BBQ and mayo which suited me fine, so I left those and just added extra of everything else. I could have sworn I added extra pickle and onion, but they didn't show up (nor are on the receipt). Maybe the kiosk only allows a certain number of extras to stop people like me doing things like this? Still, I added crunchy onion and got it, so that was good. All rolled together, the meal came to €13,90. Or an exactly round €12 without the onion rings as extra. This is actually cheaper than McDo's premium "Signature" meals. I'm really really happy with whoever decided that the crunchy onion bits go on top. I could take the lid off, flip it over, and enjoy the top of the roll with onion bits smothered in mayo. Absolutely sublime. I must make a confession here, I eat burgers with a knife and fork. I ask, and they (BK and McDo both) give me a plastic set usually used with salads. I don't like picking them up and shoving them in my gob, it just seems... I don't know... distasteful. Besides, how can one eat a burger like that pictured above without bits falling out? So, next job is to deal with the veg and the bacon bits. Then, on to the meat. Three patties, stuck together with cheese slices. The meat had a really nice taste and was juicy - two things that rarely happen "chez le competition". Normal chips in a box, served hot (another thing the other place tends not to get right). On top of this was squirted what I can only describe as liquid Kraft slice. And finally some cut bacon dropped on top. But the main issue was whatever was pretending to be the cheese. Yup. Snails. As a microwavable ready meal, without palm oil (whoo!). Okay, that's it. I've now seen everything. 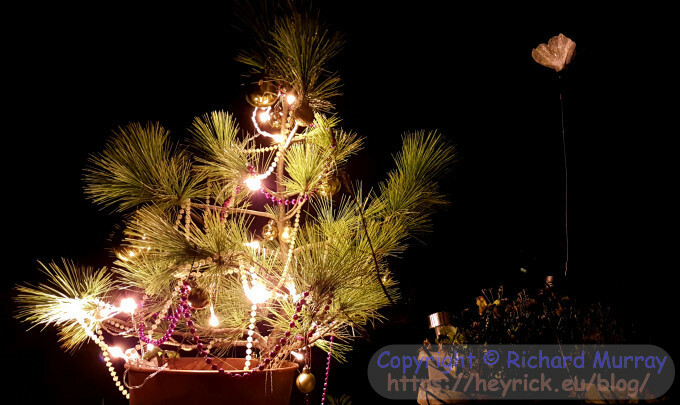 It's now time to make the tree look like a regular tree and forget about Christmas for another eleven months (or at least eight, given the way shops bring out the Christmas stuff before the Halloween stuff these days). So one last photo. This was taken with my phone (an S7) in long exposure mode. Happy New Year. I am afraid your descriptions of burgers make my gorge rise. Only once in my life have I bought a hamburger, from a little place in a back street in Brighton, to which I was recommended. Otherwise I only eat those I cook for myself, typically the Danish carbonade, a burger made of veal. For reasons that probably require a Freud to explain, I hate sauces of any kind: mayonnaise, dressing, gravy, vinegar, cheese, custard, creme fraiche, ... they all revolt me.I prefer my food dry, solid and separate. No glurk, no gloop. Eating out is an ordeal. My wife dies of shame if I attempt to explain my hang ups. So apologies if I air them here. I got dirty looks in a restaurant in Paris once when I complained that the meat was not cooked. It should be black on the outside, I explained - carbonise'. Do not get me wrong - I love food, it just has to be prepared my way. Anyway, all the best for 2019. I'm currently trying to persuade them to allow ice cream to be allowable as a drink in the "burger, fries and drink" discount combo. In the middle of summer I'd much prefer an ice cream than a drink. Gavin: yes, I've been known to cry out "this meat's not cooked!" when eating out.